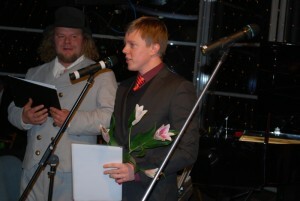 On the 7th of January 2011, a formal ceremony was held in hotel Strand to hand out awards and acknowledgements of Eesti Kultuurkapitali Pärnumaa Ekspertgrupp ja Pärnumaa Spordiliit to successful cultural and sports events and people. 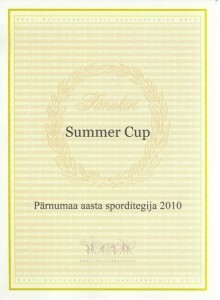 This time, international youth tournament Pärnu Summer Cup 2010 was awarded with the “Best sports event in Pärnu County 2010” title. The award was received by Tarmo Meresmaa (on picture below), who is one of the main organizers of Pärnu Summer Cup. Meresmaa stated that this acknowledgement is a good sign towards future co-operation between city and country. Longer review of the event (in Estonian) can be read here. On the 20th of May 2009, in Ammende Villa, international youth football tournament Pärnu Summer Cup 2008 was awarded with the title “Best tourism event of 2008” handed out by Pärnu Convention Bureau. This award aims to acknowledge organizations, who contribute to the development of Pärnu’s tourism industry.